In his thread Just Pictures: Storms and Lightning, Timbuctoo displays some excellent shots. Tim has nature on his side as the area in which he lives does have some spectacular weather effects. But there's more to it than just pointing and poking. I will ask Tim to be the first to respond to this post, and show some more of his work here as well as describing some of his techniques. Beautiful, but very dangerous. Safety precautions are a must when photographing storms with a potential for lightning. I am a lightning strike survivor, and wouldn't want anyone else to share my experience. Use the 30-second rule to estimate lightning distance. Never be outside when lightning is striking closer than six miles (30 seconds between the flash and the thunder). Be especially observant of storm development around you. If you are photographing a supercell, extend your distance for photography to ten miles or more. Practice lightning photography with the same safety in mind as you would any other activity during thunderstorm season. The best location to photograph a storm is from a distance greater than six miles. Positioning yourself where the storm is passing transverse to your field of view provides a safer location to photograph and to isolate the region of the storm where the ground flash activity is most concentrated. It also allows for tracking the active area as the storm changes. The use of a medium telephoto lens will allow you to compose the Lightning Landscape and determine the degree to which the lightning lightning flash plays a role in the image. Wide-angle zooms in the 28-200 mm range provide excellent flexibility for lightning photography. Isolated cells are the easiest and safest to photograph and they also provide the best photo opportunities. Embedded systems usually have multiple cells producing lightning and are more difficult to photograph. They also tend to be less photogenic. Lightning strikes will occur from any region in and around a storm. Typically, you will observe not only the strikes preceding, trailing and occurring within the rain shaft, but also often when there is no rain. Strikes may occur from upper regions of the storm and travel outside of the cell to the ground. Although lightning activity may be occurring around the rain shaft at a distance of six miles, you should not position yourself under the cloud. Relocate to a safe distance. Always be aware of objects around you that may attract or conduct lightning. Fences and overhead lines dominate the landscape. Do not set set your camera closer than 50 feet from a pole or a fence line even if the storm is more than six miles away. Photographing advancing storms is not only dangerous, but also difficult to do since the area of lightning activity is broadening as the storm is approaching. The area of the storm where the lightning activity is occurring changes constantly as the storm develops and dissipates. Observation of storm development is very important not only for maximizing photographic opportunities, but for safety too. At distances closer than six miles, photographic activities should be limited to indoors or from within a metal bodied automobile. The use of a windowpod is recommended when shooting from within a vehicle. Photographing close storms should be avoided. Again, the closer you are the more difficult it is to predict where the lightning activity will occur. It's best to relocate to a safe area. Remember that distance equals safety and distance equals the best photo opportunity. Let your lens do the work! Trying to take better photographs in Louisville, Kentucky. I am a lightning strike survivor, and wouldn't want anyone else to share my experience. Aarif, the bolt hit right beside me, so I didn't get burned, but I got shocked, and it knocked me out for a while (not sure how long, I was by myself and my watch stopped). The flash affected my vision for a couple of days, but I didn't have any continuing symptoms I could attribute to it. I wasn't chasing, just standing on the front porch minding my own business while it rained when lightning struck the iron railing where I was standing. The next closest strike was when I was hauling a load of hay in a pickup truck. I had parked because it was raining too hard to see, and lightning struck a tree on the side of the road about 15 feet in front of me. It was 20 minutes before I could see to drive. I have a very healthy respect for it. @GBW, nice read there and a very frightening and interesting story of yours. I wish to visit lightning alley in USA, haha! "Use the 30-second rule to estimate lightning distance. Never be outside when lightning is striking closer than six miles (30 seconds between the flash and the thunder). Be especially observant of storm development around you"
Greatbluewhale.... your instructions above are very important as you can atest to. 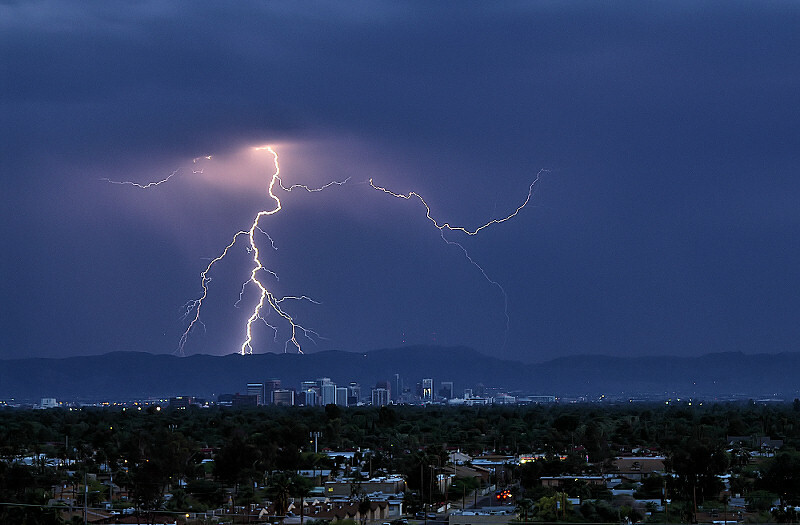 Strange as it may seem here in Phoenix most of our storms produce very little or no thunder with the lightning !!! Here is one I captured tuesday just after sunset. CT Yankee, that is a great and hard to get shot (daytime lighting). Do you have a lightning trigger? If not that's a lucky one. For those of you that don't know what they are they're a little black box that sits on your cameras hot shoe and can detect electrical discharges. This is very useful for the elusive daytime lightning shot and especially good for the evening lightning when it's just a bit to bright for the long exposures. Type lightning trigger into a GOOGLE search and you will see what I mean. Some people have even made there own, any electrical engineers in DYXUM?? It's dead quiet here on the storm front at the moment because it's the Dry Season but things are looking great for this coming Wet Season. We have had a warmer than average Dry so far with even a bit of rain which is something to look for if a LaNina is on the way. Australia has been in a drought for 15 years and there are signs that things may be on the turn around. I hope this coming Build Up will be an explosive one. It seems you guys don't need any tips on how to capture lightning as you are doing it perfectly and most of you probably leave me for dead in regards to experience so please keep the awesome shots coming. Oh, for those that don't have a lightning trigger maybe try stacking some ND Filters in the daytime and then you might get a longer exposure!! The waiting game is evil!! I have looked at the Lightning Trigger website and nearly fell off my chair at the price!! We get lightning down here but mostly flash no great bolts (sometimes during the day) so timed exosure is useless especialy if you get a really big flash... I have seen sites that have the formula to make a trigger but my question is - is there anything between the $US300+ and the possibly dodgy made job that will capture lightning?? The storms are back in Darwin and surrounds. We chased this storm to Litchfield National Park about 150kms south of Darwin and it proved to worthwhile. These are only the little teaser storms but it's good to get prepared for the big ones next month. I'll upload pics as I go as promised. Well I posted this shot somewhere else, but I did not know about this thread so here it is again, apologies if you have already seen it. This is in Singapore taken from the 16th floor.